"Shine or Shower, you'll be right in fashion in our all weather wonders." I absolutely love old catalog copy! So, for a change of pace, and perhaps to inspire some of you vintage sellers who write descriptions for your vintage wares, here are snippets from this vintage catalog scan. "Glamor raincoat, hat and umbrella will shine fashionably in any kind of weather. Snappy combination of rich gabadine and candy-striped taffeta..."
"In all kinds of weather, the year round, you'll love wearing this water-repellent cotton tweed ensemble that's really in fashion! Back bowed-and-pleated coast is so stunning with its pointed collar, push up sleeves, vertical welt pockets." "All-purpose water-repellent corduroy companions to wear in any weather... any time of day! 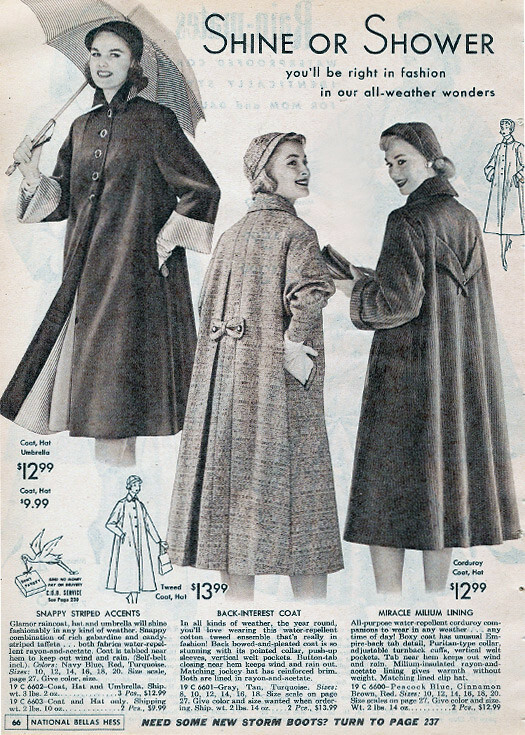 Boxy coat has unusual Empire-back tab detail, Puritan-type collar, adjustable turnback cuffs, vertical welt pockets. Milium-insulated rayon-and-acetate lining gives warmth without weight." Gorgeous! I love the one on the left and the one in the middle. Who wouldn't want to wear that today? gorgeous, what a chic way to say warm. aw this is gorgeous!! what a cute post, i love it! keep up the good work!